"I'm trusting in God and praying for radar. But the essential arithmetic is that our young men will have to shoot down their young men at the rate of four to one...if we're to keep pace at all." Guy Hamilton's Battle of Britain is a rousing, shamelessly patriotic movie. It's storytelling could easily pass for the propaganda war films of the 1940s. You can feel the reverence the filmmakers feel for the brave British pilots who saved their homeland from the onslaught of Nazism. In the summer of 1940, Germany's shadow is long and treacherous. France has just fallen and Hitler is convinced that England will accept his peace offer. However, Churchill's government refuses the Nazi's offer and thus begins the massive aerial battle between Germany's seemingly unstoppable Luftwaffe and England's miniscule Royal Air Force. Led by the dignified and pessimistic Sir Hugh Dowding (Laurence Olivier), the Brits prove resilient and for nearly half a year engage the enemy in dogfights as their airfields are destroyed below. A trio of officers comes into their own in the process. There's Colin Harvey (Christopher Plummer), who struggles to maintain his marriage to the feisty Maggie (Susannah York). Along Harvey's side is Skipper (Robert Shaw), who practically spits bullets when speaking to his NCOs. Lastly, the RAF's Squadron Leader Canfield (Michael Caine) leads his men valiantly into the blue skies above the English Channel. The screenplay, by James Kennaway and Wilfred Greatorex, moves through the elongated battle swiftly. The movie is primarily devoted to the dogfights, which are captured stunningly by the aerial sequence director Bernard Williams, but pauses for human drama on the ground. Just about every cliché in the book is employed, such as the first-time pilot who dies tragically. Hamilton has assembled an accomplished cast of actors who are so effective in their roles that it hardly matters that they are little more than cardboard cutouts. Some of Maggie's behavior is too theatrical to pose as serious drama, such as when she scolds a commanding officer for yelling at her, but the strained marriage still works for me. Granted, when the Germans bomb London and it ruins the Harveys quiet night together the marriage seems relatively unimportant, but it pays off in later scenes when Colin goes off to fight. Caine comes off well as Canfield, playing the soft-spoken hero with swift confidence. Shaw is also a delight, capturing the tough-as-nails persona perfectly. And, as always, Olivier turns in a fantastic performance, filled with fear and integrity. However, the real delight of the film is not the acting, but the fantastic action scenes. Meticulously crafted, each dogfight plays well and, although some of techniques are obvious and dated today, is captivating. The bombing of London is especially well realized, creating one of the most vivid recreations of the event ever committed to celluloid. Personally, I think the climactic battle scene seems to last longer than it should and robs the movie of its full impact. However, the technical craft always looks impressive, thanks largely to Freddie Young's cinematography, and makes up for the script's rather simplistic depiction of the events. There are no shades of gray in the film. The Germans stand for Evil, the British for Good, and God favors the good. I can't deny that the overly simplified characters are slightly disappointing, yet the earnest admiration the filmmakers have for the RAF makes up for it. Watching Battle of Britain is not seeing history, but a vivid telling of heroism. It would likely be a better film if Hamilton added more complexity to the characters, but as it stands this is a fitting tribute to those men who fought for the principles of liberty and justice. Image Transfer Review: The anamorphic 2.35:1 widescreen transfer has a nice filmlike look to it, with a good sense of depth and detail. Colors are somewhat bland, apart from the skin tones and numerous fiery explosions, and there's a slight touch of grain to the picture. The flaws in the transfer can likely be attributed to the film's age, but the overall picture looks nice. I've never seen the previous DVD release, so I cannot compare the transfers. Audio Transfer Review: The audio gets a brand new Dolby Digital 5.1 mix that uses the rear-channels rather well. The dogfights are fully engrossing thanks to sound separation and directionality, neither of which feels particularly gimmicky. Dialogue is crisp and well balanced in the mix, and the score permeates from all angles quite nicely. There's also an alternate English Dolby Digital track (see the extras review) that is slightly more front heavy, but effective nonetheless. Additionally, the original mono mix is also included and, for me, actually seems more fitting. A French Dolby Digital 5.1 mix is also available. Insert—contains information about the battle and film's production. Optional William Walton Score—the entire film remixed in Dolby Digital 5.1, featuring an alternate score. Recollections of an R.A.F. Squadron Leader—real life participant in the Battle of Britain, Basil Gerald Stapleton. Images From the Sky—a montage of still photographs taken during the aerial sequences. Extras Review: This two-disc set features all-new special features that make for a very informative collection of material. Things start off with an insert that features a brief overview of the battle's history and head-shot comparisons between the principal cast members and the real life figures they portrayed. There are also some facts about the production, some of which are interesting. On Disc 1, a feature-length commentary by director Guy Hamilton, aerial sequence director Bernard Williams, aerial coordinator Garth Thomas, and historian Paul Annett. Williams dominates this track, with each man recording his part separately, and gives many insights into the production. Annett and Thomas also contribute some anecdotes and trivia. Much of what is discussed relates to the aircraft and the many challenges involved in staging the dogfights, however other elements of the production come up on occasion. Hamilton's input is minimal and there are some gaps of silence, yet the commentary is largely informative and interesting. A second audio option with the film is an Optional William Walton Score, mixed in an English Dolby Digital 5.1 mix. This is a rather unique feature, presenting the film the way it would have played had the producers decided to keep Walton's score over the final one by Ron Goodwin. Whether Walton's music works better for the film is honestly just a matter of opinion, but I rather enjoyed it and thought some of his queues work better. Over on Disc 2, there are three documentaries. 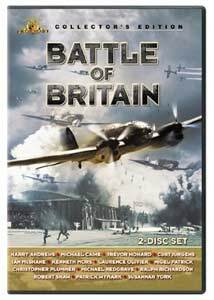 The Battle for the Battle of Britain (52m:32s) was made by Paul Annett as a publicity tool for the movie's release. Michael Caine narrates the documentary, which contains a variety of behind-the-scenes footage and clips from the film. This isn't the most pervasive look at the movie, but it relays some good information about the filmmakers' intentions. It's a solid look at the production with a hilarious introduction interviewing Americans about the battle—consider some of them to be precursors to Jay Leno's "Jay Walking." Following that is A Film for the Few (20m:20s), with interviews by Hamilton, Williams, and Susannah York among others. They discuss how they came to the project and the movie's effect on the public. Everybody interviewed seems to have really enjoyed the making of the film. The third documentary, Authenticity in the Air (22m:33s) consists of interviews with Thomas, Williams, and Annett about shooting the aerial sequences. This is my favorite of the extras, giving lots of anecdotes about the dangers and struggles encountered on a daily basis, some of which would never have occurred to me otherwise. Recollections of an R.A.F. Squadron Leader (09m:29s) is a video interview with Basil Gerald Stapleton, who actually fought in the battle. His insights into aerial combat are astute and his stories fascinating. He goes into some aspects of the battle, such as radar limitations, not explored in the movie and gives us access to the unique mindset of a combat pilot. Next is a montage of pictures taken during the shooting of the dogfights. Images from the Air (03m:52s) sets the still photographs to the film's score, but sadly doesn't really provide any truly interesting pictures. Lastly, the film's original theatrical trailer is shown in anamorphic 2.35:1 widescreen, along with the trailers for The Bridge on the River Kwai, "The Best of WWII Movies," The Great Escape. An entertaining treat, Battle of Britain: Collector's Edition is a nice re-issue that should please the film's fans. The transfers and extras make for a fine package.